Earlier have shared many tutorial examples on selenium IDE different commands and Its usage. You can view each of that example on Selenium IDE Tutorial. Still many peoples are using selenium IDE to automate their small web applications and sometimes they needs to perform compatibility testing In Google Chrome and IE browsers like submitting form, registration, login etc. activities. We can perform these activities very easily In google chrome and IE browsers using Selenium WebDriver and you can view related tutorials link on Selenium Tutorial. Is It possible to run selenium IDE test In Google Chrome? Yes.. Follow steps given bellow to run selenium IDE test In google chrome browser. We need Selenium Standalone Server jar file to execute selenium IDE test In google chrome browser. Download Selenium Standalone Server file from THIS PAGE as shown In bellow Image. You will get "selenium-server-standalone-2.46.0.jar" file when click on link as shown In above Image. Copy paste "selenium-server-standalone-2.46.0.jar" file In D: drive for easy access. Note : 2.46.6 Is current version of jar file. It can change In future. 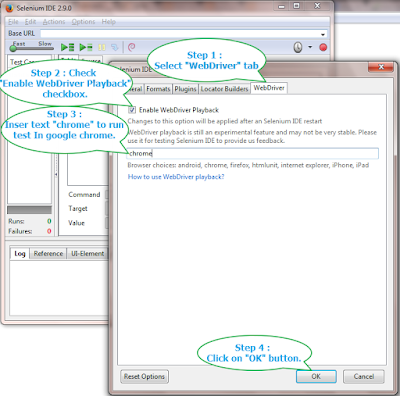 You can view THIS POST to know how to download ChromeDriver server file. You will get "chromedriver.exe" file. Copy paste "chromedriver.exe" file In D: drive for easy access. First of all you need to Install selenium IDE as described In THIS POST If It Is not available with you In Mozilla Firefox browser. Now Go To Selenium IDE window's "Options" menu -> Select "Options" sub menu. It will open Selenium IDE Options dialog as shown In bellow Image. 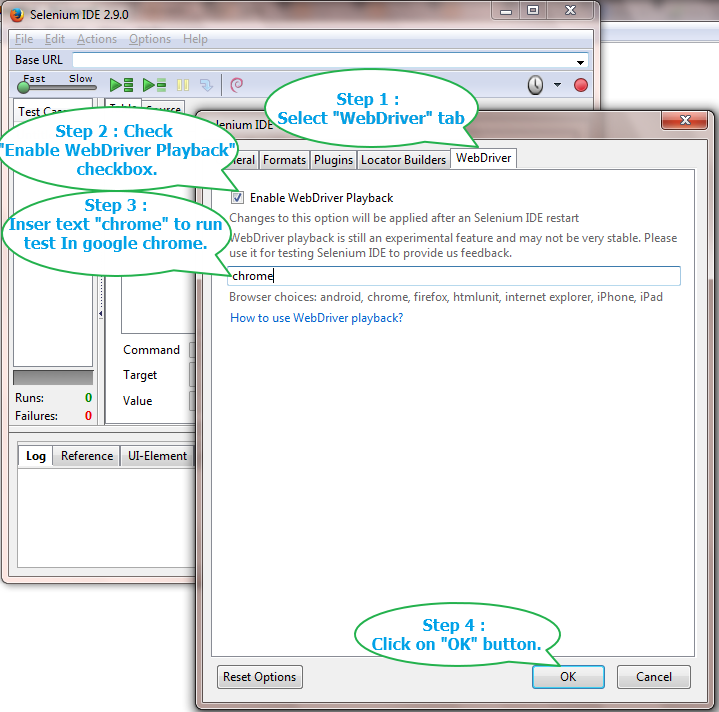 Select "WebDriver" tab and check "Enable WebDriver Playback" check-box and write "chrome" In browser choice textbox as shown In bellow Image. Click on "OK" button and close Selenium IDE Window. Note : "selenium-server-standalone-2.46.0.jar" and "chromedriver.exe" files must be In D: drive. 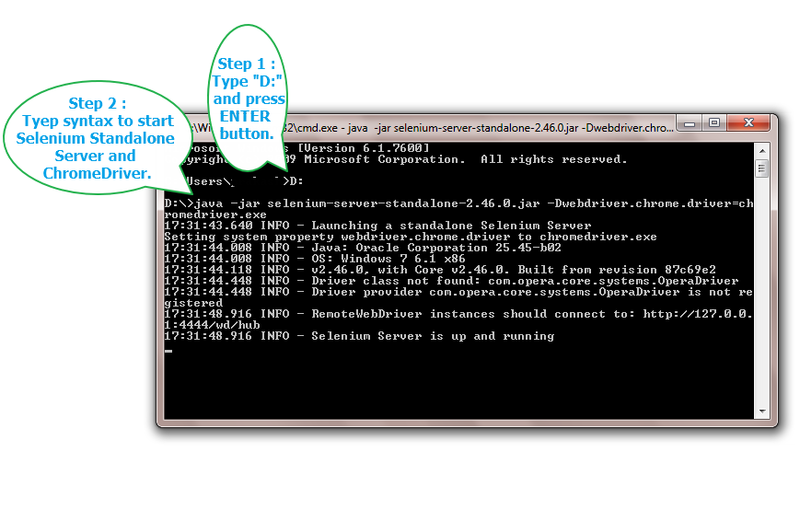 Follow steps given bellow to start selenium standalone server and ChromeDriver. Navigate to D: drive by typing D: In command prompt. Execute bellow given command In command prompt. 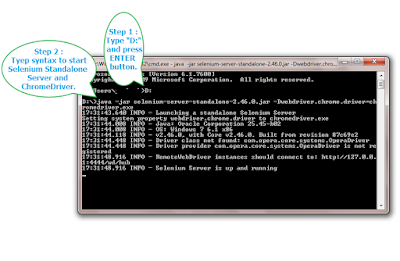 It will show message "Selenium Server Is up and running" In command prompt as shown In bellow Image. Note : Modify selenium standalone server version In bellow syntax If It Is different than 2.46.0 before execution. Now we are all set to execute selenium IDE test In google chrome browser. Restart Selenium IDE and then execute bellow given example test In selenium IDE. It will launch google chrome browser and execute test In It. This way we can execute selenium IDE test In Google Chrome browser.